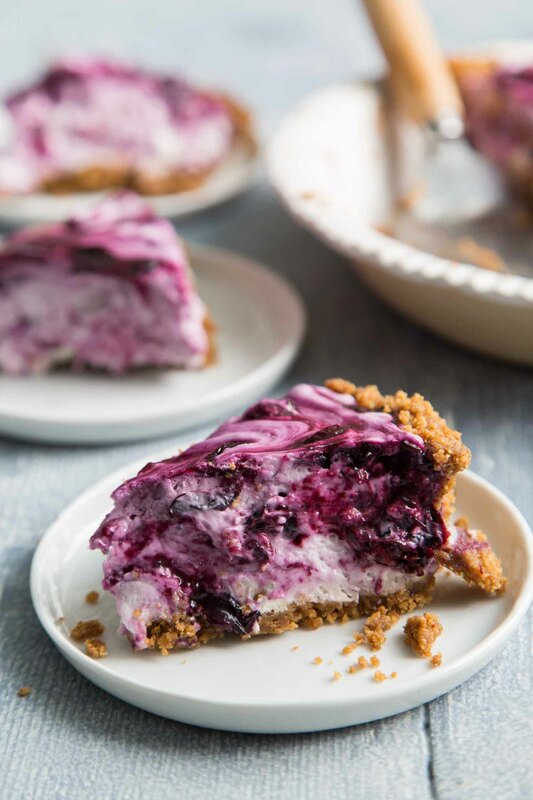 This no-bake blueberry icebox pie features cooked blueberries mixed into a cream cheese based filling and a gingersnap cookie crust. 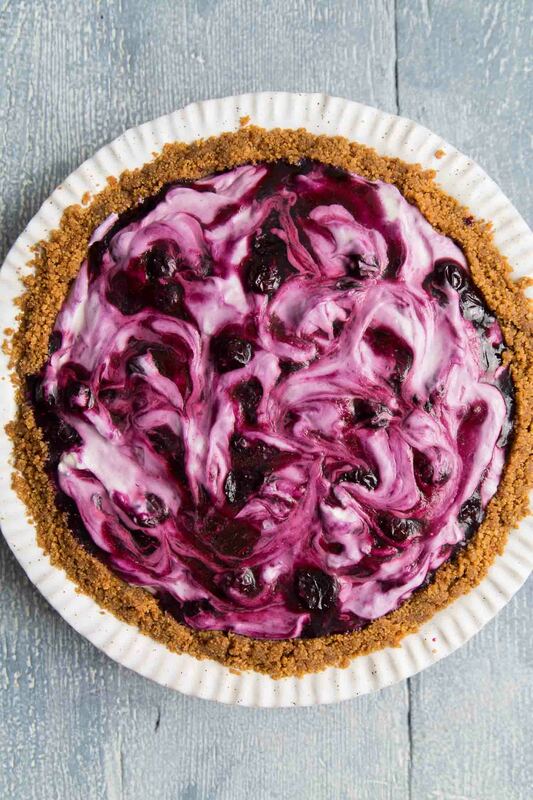 Life is messy and so is this blueberry icebox pie. I tested the recipe several times to experiment whether I could make the final pie a little cleaner. And my “cleaner”- I mean easy to remove from the pie plate in a clean swoop. Nope. It’s consistency messy, but so ridiculously delicious. However, if you want to present this as a fancy clean dessert- I suggest making it in a springform pan and calling it an icebox cake. This no bake dessert starts with a cookie crust bottom. I used store-bought gingersnap biscuits/cookies. The spice from the ginger mixed with the sweetness of molasses plays wonderfully with the blueberry cream cheese filling. If you don’t like gingersnap, feel free to substitute in graham crackers, vanilla wafers (such Nilla wafers cookies), or speculoos cookies (such as Biscoff). The gingersnap is roughly ground in a food processor and tossed with melted butter. The filling consists of two parts: cooked blueberry gelatin and whipped cream cheese. Fresh blueberries cooked with sugar and lemon juice until about half of the blueberries have burst creating a rich syrup. Bloomed gelatin is mixed in and allowed to cool to thicken. In another bowl, cream cheese is beat smooth with powdered sugar. Chilled heavy whipping cream is added and the mixture is whipped until thickened. 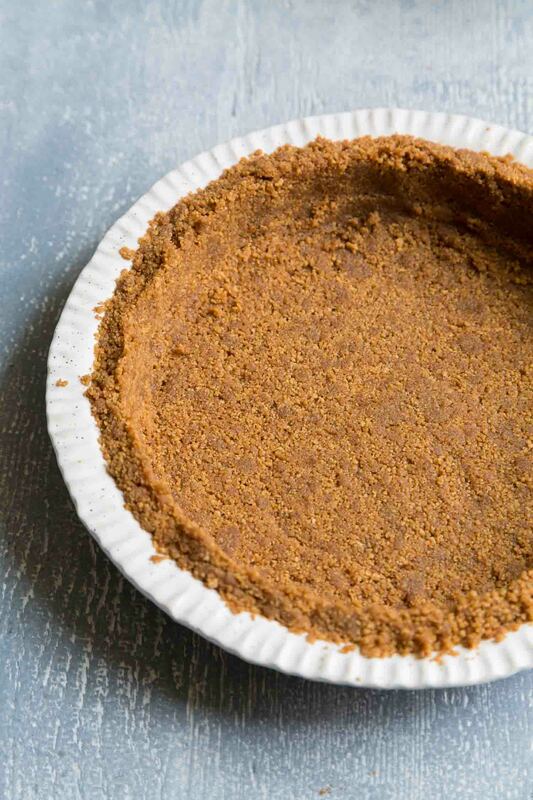 The two filling components are gently folded together in the gingersnap crust. And here’s the most difficult part- you have to let the blueberry icebox pie chill in the fridge for a few hours to set up (preferably overnight). 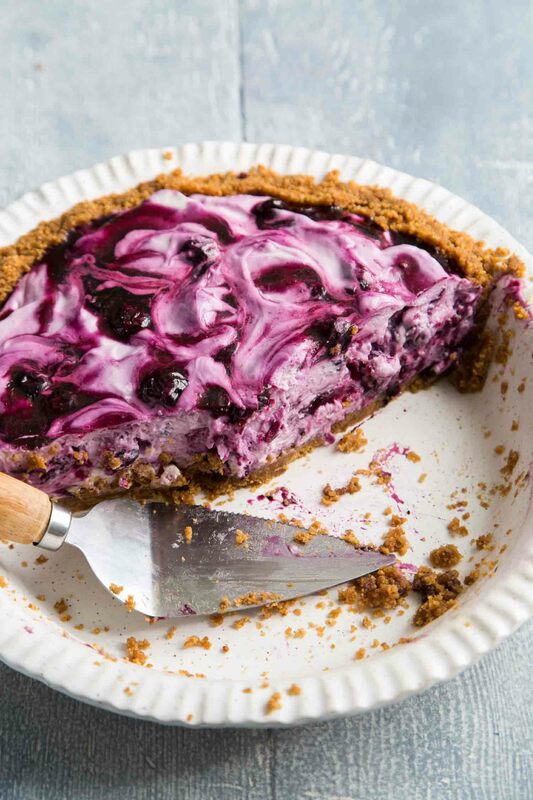 The resulting blueberry icebox pie is sweet yet tart, smooth yet crunchy. It’s an explosion of flavors and textures that I can’t get enough of. It may look a bit messy and unrefined, but I assure you, it tastes absolutely delicious. Crust: In a food processor, pulse gingersnap cookies into a rough powder. Stir in melted butter. Use the flat bottom of drinking glass (or your palm and fingers) to press crust mixture into the bottom and up the sides of a 9-inch pie plate. Cover and keep chilled in the fridge until ready to fill. Blueberry Gelatin: In a small sauce pot, combine blueberries, sugar, and lemon juice. Set over medium heat and cook until sugar has dissolved and half of blueberries are still whole. Meanwhile, bloom gelatin. Sprinkle gelatin over cold water and allow to sit for 5 minutes. Whipped Cream Cheese: Using the bowl of a stand mixer fitted with a paddle attachment (or using an electric hand mixer), beat cream cheese and powdered sugar until smooth. Scrape down bowl as needed to ensure thorough mixing. Add vanilla and heavy cream. Continue to beat until mixture has thickened to almost stiff peaks. Assembly: Remove crust from fridge. Spread of thin layer of whipped cream cheese mixture over the crust bottom. 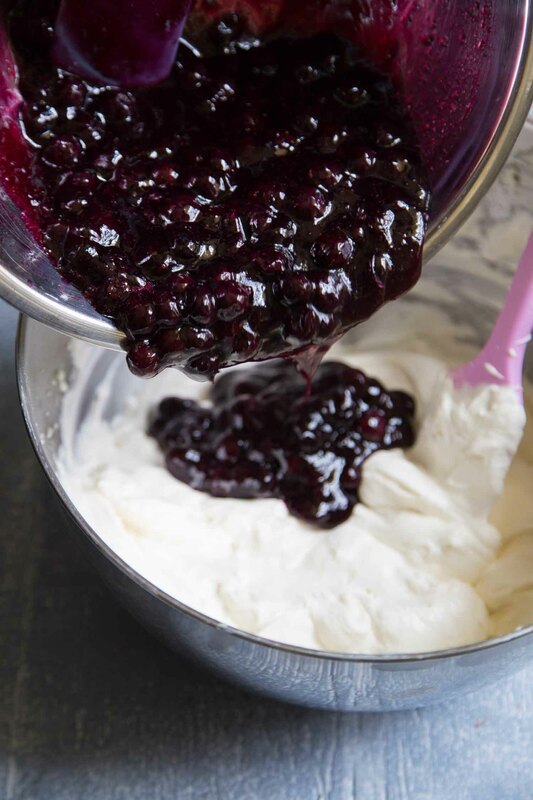 Gently fold chilled, thickened blueberry gelatin into whipped cream cheese mixture. Transfer to prepared crust. Cover with plastic wrap or store in an airtight container in the fridge for at least 3 hours (overnight is best). Blueberry gelatin mixture will be quite thin in consistency when warm. Cool mixture at room temperature (which can take 1-2 hours), or set bowl over an ice bath to quickly chill mixture. Other option- let gelatin mixture chill in the fridge for about 30 minutes. Check on mixture every 8-10 minutes to make sure it has not solidified completely. Blueberry gelatin needs to be thick and cool when folded into whipped cream cheese mixture. Otherwise, you will not get the swirls of blueberry sauce. Interested in more no bake icebox desserts? The combination of flavors in this pie look and sound so amazing!